When Vlad Shmunis launched Internet telephony startup RingCentral back in 2003, the word "cloud" was more commonly associated with rain than with computing. Taking a page from NetSuite in the accounting software space and Salesforce.com in CRM, Shmunis bet that he could beat traditional telecom providers by streaming phone service over the Internet. "I felt the right solution was to take telephony into the cloud," Shmunis recalls. "Forget the box, forget the software license, just deliver it as a service. 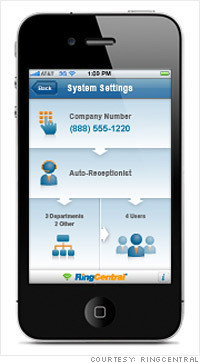 "Today RingCentral competes in a fairly crowded market for cloud-based telephony, including smaller players like 8X8 as well as Goliaths like Verizon, Alcatel and Lucent. But Shmunis has carved out a distinct niche in the telecom market, offering streamlined service packages aimed mostly at business customers with fewer than 200 employees.Today the company boasts about 200,000 business customers and has signed up AT&T to resell its services. "RingCentral knows who its market is and has done a good job of keeping it simple," says Diane Myers, a telecom analyst at market research firm Infonetics. These budding entrepreneurs didn't have to wait for an MBA to get down to business.